UN Special Envoy on sexual violence in conflict Zainab Bangura (left), during a meeting with South Sudan’s First Vice-President Riek Machar. 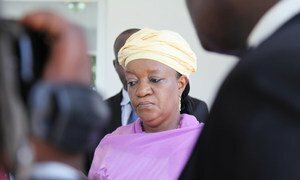 “Successful implementation of the Peace Agreement will require that sexual violence crimes are monitored, tracked and reported, and are addressed in all transitional justice processes,” stressed the Special Representative, Zainab Hawa Bangura, in a press release. The Special Representative said the commitments are contained in a Joint Communiqué that she and President Salva Kiir signed on 11 October 2014, as well as in a Unilateral Communiqué issued on 18 December 2014 by current First Vice-President Riek Machar. In their respective communiqués, the signatories had committed to immediately cease and prevent the commission of sexual violence crimes, hold perpetrators accountable, improve services to survivors, and ensure that sexual violence considerations are included in the ongoing processes of security sector reform, as well as disarmament, demobilization and reintegration, Ms. Bangura said. “I commend the steps taken by both signatories to put in place arrangements to facilitate the implementation of these commitments, including the designation of High-Level Focal Points, the creation of Technical Working Groups and the development of Implementation Plans, as well as the signing of undertakings by 53 senior commanders of the SPLA-IO [Sudan People’s Liberation Army in Opposition],” the Special Representative said. Despite these commitments and the progress made to implement them, Ms. Bangura emphasized that sexual violence crimes have continued to be systematically committed in the context of the conflict. ‘‘Now, more than ever before, it is imperative for the authorities of the Transitional Government of National Unity to ensure accountability for these crimes,” she added. During her visit, the Special Representative engaged with the leadership of the SPLA and the South Sudanese National Police Service (SSNPS), who she said have committed to taking concrete and time-bound actions to address sexual violence in accordance with Security Council resolutions 1960 (2010) and 2106 (2013). “My Office will pursue its support to the SPLA and SSNPS in developing Action Plans, which will provide a structured and comprehensive framework through which to address sexual violence crimes,” Ms. Bangura said. The Special Representative, who visited South Sudan at the invitation of the Government, met with President Kiir, First Vice-President Machar and other key government officials. She also held meetings with women’s groups providing services to survivors, the humanitarian community, and the diplomatic corps. This visit follows Ms. Bangura’s previous visit in 2014, during which she met with survivors and survivors’ groups, and underscored the urgent need for resources to support multi-sectoral services for survivors, who often suffer trauma, marginalization and stigmatization. The United Nations Special Representative on Sexual Violence in Conflict today commended 54 ranking members of the Sudan People’s Liberation Movement/Sudan People’s Liberation Army-in Opposition (SPLA-IO) for signing “explicit undertakings” to prevent conflict-related sexual violence.